Is there anything better than starting off your day with a perfectly toasted bagel? From whole grain to gluten free, sourdough and more, bagels are the way to go here in Indiana. There are many bagel shops to choose from, but here are the nine best in Indiana! Bagel lovers rejoice! Studebagels is THE place to be for the best bagels in Indiana! With 20 flavors of bagels to choose from, you’ll find yourselves lost in a sea of bagels. Ask about their daily special bagels, such as the cheddar bagel, cinnamon addiction bagel or the pesto asiago bagel. It’s a bit different but delicious nonetheless. For cream cheese, try the salsa or berry cream cheese. You can also order your bagels split and smothered with PB&J or cinnamon honey butter. For lunch, try a roast beef bagel sandwich or the hummus sandwich with either garlic or tomato basil. There are two things to love about Big Apple Bagels: they serve breakfast all day long and their bagels are amazing! BAB prides themselves on having made from scratch bagels every day. And each bagel is hand made by the amazing staff at Big Apple Bagels. 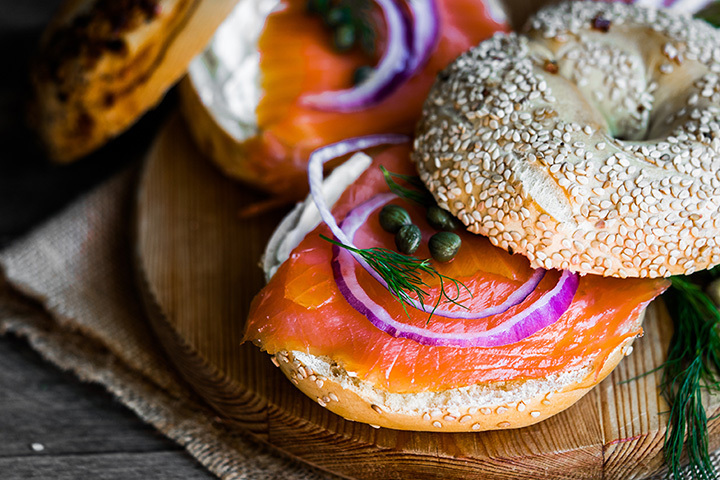 For breakfast, try the Start Fresh Breakfast Sandwich on a bagel of your choice or a lox and cream cheese. For lunch, try a Holey Guacamole or the Big Apple Club. For those that prefer just a simple bagel and cream cheese, try a whole-wheat bagel with garden veggie cream cheese! You won’t be disappointed. Head on down to the Broad Ripple area in Indianapolis for a delicious bagel at Ripple Bagel and Deli, the only bagel shop in Indianapolis that steams their bagel sandwiches. A casual dining atmosphere, Ripple Bagel and Deli is the place to go when you want to catch up with a friend or family. The cheese spreads are made in house, and there are so many bagels to choose from. You can have the Banana Sunrise on a raisin bagel, or a PB&J on an Apple bagel. Yum! Everyone knows that if there is one place to be in Indiana, it’s Rochester. And what better way to do Rochester than to eat at Rochester Bagel and Coffee House, home to the best bagels in the Fulton County area! Their bagels are made from scratch and baked fresh daily, making them deliciously delectable. For breakfast, try the orange cranberry or very berry with apple butter. For lunch, try the chicken salad on a wheat bagel. Bagel Fair, Inc. is a second generation, family owned and operated bagel joint in Indianapolis. Bagels are made fresh daily, from a family recipe going back over 100 years. Dubbed true authentic New York bagels, the owners of Bagel Fair, Inc. take pride in making their bagels the right way and keeping their customers coming back for more. Feeling like you need a bit of spice in your life? Try the jalapeño cayenne with scallion cream cheese! If you should ever happen to find yourself in the small city of Richmond, Indiana, you must stop at 5th Street Coffee and Bagels. This little shop is quaint in its appearance, with charm and eclectic yet tasteful décor, and serves up the most delicious bagels that Richmond has to offer. Feeling like you need some sweetness in your life? Try the chocolate chip bagel with the chocolate chip cream cheese. If you should happen to find yourself down on East Street in Indianapolis, Indiana, be sure to stop Henry’s Coffee Bistro, or as it is more commonly known, Henry’s on East. Their BLT bagels are to die for, as is their veggie, egg & cheese bagel with yogurt or banana on the side. The owners and staff are so warm and welcoming and you’ll feel like one of the family by the time you leave! With four locations throughout the Bloomington, Indiana area, bagel lovers are bound to find their favorite bagel at the Bloomington Bagel Co. In business for over 20 years, BBC has been serving up some of the most delicious bagels Bloomington has ever seen. Try a mouth-watering California Pizza bialys (which is a stuffed and flattened bagel), or the 11 Grain Everyseed bagel with light roasted red pepper parmesan schmear (cream cheese). BBC also has the most amazing Oreo chocolate chip brownies if you find yourself with a sweet tooth after your bagel! Head on down to Jasper, Indiana and visit the Azura Grill & Café, where their motto is “Keepin’ it fresh” seven days a week! The café get its start originally in 2004, when owners Nick and Angie purchased the Bronx Bagel. However, in 2006, an old gas station went up for sale, and both owners knew that was the place for what is now known as the Azura Grill and Café. Serving up traditional bagel breakfast sandwiches like the Ham, egg and cheese bagel or the bacon, egg and cheese bagel, the café has been going strong for the last thirteen years. You will also find traditional bagels such as blueberry and cinnamon raisin, but they also offer a delicious cranapple bagel as well. Be sure to try the strawberry gourmet cream cheese on your bagel!